Date was entered wrong when the initial Transfer Request was made. Based on a Progress Report, the supervision term is changed. Based on a Violation Report, the supervision term is changed. 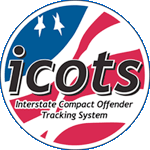 From the offender’s profile, users can locate the change feature from the Compact Cases tab. Click on the change hyperlink and update the “Supervision Ends On” field and click submit to record the change. Upon submission of the end date change, the system will not automatically generate a notification to the receiving state user. It will be the sending state user’s responsibility to notify the receiving state user via a Compact Action Request. If necessary, a document regarding the date change can be uploaded at this time. An email notification to all interested users including supervisors and the compact office will be sent upon submission of the Compact Action Request. Q: When changing the supervision end date, is an email generated notifying the receiving state and what's the best way to provide information to the receiving state so they can inform the offender if needed as to why the term of supervision was modified? A: As the sending state determines the length of supervision, modifications may be necessary for a variety of reasons. These may include sentencing miscalculations, good time credits, etc. An email is sent to the receiving state upon modification of the supervision end date and it is best practice the sending state follow up with a Compact Action Request selecting 'Supervision Update/Request' as the specialization.